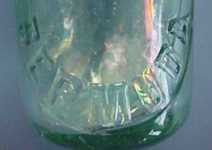 "Admiralty Arrow Antique Glass Bottles"
The bottle type was used from Date?. The marble would be held in place by the pressure of the contents. The dimples held the marble out of the way to pour out the contents. 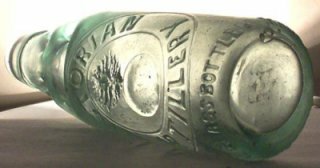 Victorian Artillery :This bottle was made for J.W.Wilding who operated as an aerated water manufacturer at Fort Queenscliff Australia where the Victorian Permanent Artillery were stationed. Seemingly his distribution was almost exclusively amongst the series of forts that were maintained around Queenscliff. Wilding himself had previously been a sergeant at the fort and also served in the army in New Zealand and India. Embossed around base "Made by the Melbourne Glass Bottle Co". Codd bottle, green aqua, circa 1890-1900. Height: 23.2 cm or just over 9 inches tall. Photo and history provided by Dave Bruce Melbourne Victoria Australia. 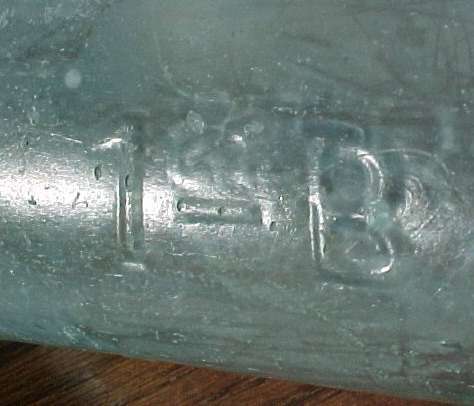 Codd Bottle: "1st B 17 th REGIMENT "
This bottle was found in Bermuda. The heavy patination suggests it was buried or in salt water for some time. This also made photography difficult. The 1st B 17 th REGIMENT likely refers to the THE 17th REGIMENT OF FOOT (LEICESTERSHIRE REGIMENT). There is reference to this battalion being stationed in Bermuda in 1888 but the registration mark on the bottle suggests a date of 1916. There is a possibility the 1st B refers to the 1st (Home Service) Garrison Battalion, The Leicestershire Regiment was formed at Easington in May 1916 where it remained. In Aug 1917 it became the 9th battalion, The Royal Defence Corps. The date suggested by the registration would be a better fit in this case which leaves the connection Bermuda a bit of a mystery. 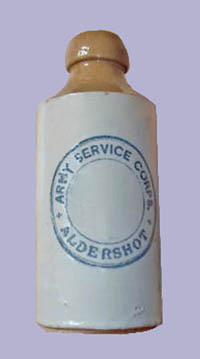 Marble stoppered glass bottle with embossing: "Artillery ..."
SAGI ginger-beer bottle (SAGI = South African Garrison Institute), from the Boer War era. SAGI codd bottle embossed S.A.G.I. (South African Garrison Institute ) on one side and M.W.F. (Military Welfare Fund) on the other side. Manufactured by Hope & Co Sheffield, likely dates to between 1900 and 1910. 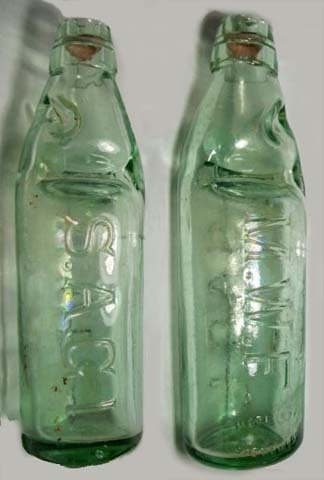 The following was provided by Johan Wolfaardt from The Anglo Boer War Museum courtesy of Vernon Erwin: Glass SAGI bottles were produced, but in limited numbers, for use in the mess halls of the British army to house soda water, cordial and beer. The ginger beer produced for SAGI (The South African Garrison Institute) was of a superior quality and endorsed by the Royal Army Medical Corps. The soda water, cordial and mineral water were found to be of a poor quality and it was advised by the RAMC to make use of local suppliers. 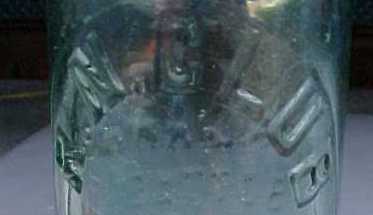 Therefore, the SAGI glass bottles were no longer of any use. They do turn up in dump sites, but the earthenware is far more common. The MWF on the back stands for the Military Welfare Fund, who were a British group that raised money for soldiers comforts. 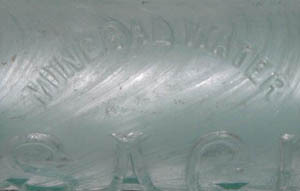 Dale Lewis, from South Africa provided photos of a SAGI codd bottle with the words mineral water factory embossed on the bottle. This pretty much puts to rest any speculation on the MWF initials on other bottles. Thanks Vernon for passing this information along.